Designed by Eero Saarinen with the collaboration of Jo Mielziner, the theatre officially opened on 21st October 1965 with a revival of Georg Büchner's Danton's Death starring James Earl Jones and Stacy Keach. The theatre was named after heiress (and former actress) Vivian Beaumont Allen, who donated $3 million for its construction but sadly died in 1962 before its completion. 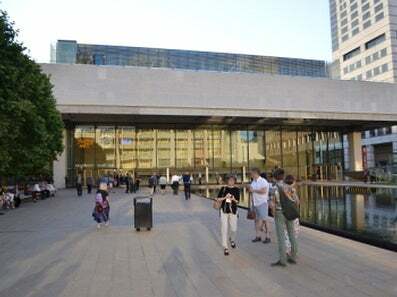 The theatre, along with its smaller off-Broadway venue the Mitzi E. Newhouse Theater, has been operated by Lincoln Center Theater since 1985. The intimate Clare Tow Theater, situated on the roof of the Vivian Beaumont, was added in 2012. The Vivian Beaumont is the only Broadway Theatre not located in the "theatre district" around Times Square.